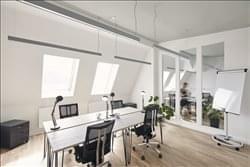 Find My Workspace lists over 95% of the serviced offices market in Berlin Mitte. Simply click Request Quote to check pricing for one office, or Add to Basket for multiple offices. This outstanding centre is well equipped with a range of facilities, including unlimited coffee and fruit water, plus a vibrant selection of custom-designed lounge areas. This center is ideal if you’re looking for somewhere to build your business empire. Located near Berlin’s major transportation hub, this shared office space is built to help teams on the road to success. Whether you’re a startup or an established enterprise, the seven floors of fresh coworking space will give you room to grow—from private offices you can make your own to sleek conference rooms ideal for creative collaboration. This business centre in the heart of Berlin provides a contemporary work space and productive atmosphere for work and networking. The space is flexible, catering to larger groups when working on projects and also providing spaces with more privacy. The offices come fully furnished with a modern style, designed to be inspiring and creative. Conference rooms come fully equipped for video conferencing facilities, along with a range of other bespoke services. The space aims to maintain an atmosphere that promotes creativity, with lifestyle appeal. The center will offer you: office spaces from one to 20 workstations. Offices of every size, including single offices, team offices, and office suites. Also offering virtual offices. This dynamic environment rejects the creatively stagnant by encouraging ambition in productivity. A separate, fully furnished 23 m² room accommodating six tables is available to help deliver collaboration to an excellent standard. This centre is highly adaptable and offers the option for single desks in a larger, more accommodating space. The larger space comprises a shared kitchenette – where coffee and tea is provided. A swift elevator ride takes you to the 4th floor office, where your business can enjoy a sensational panorama over Berlin. The centre is part of Berlin Creative Industries (architects, designers, scenographers) and offers to share their high-quality equipment (e.g. laser cutter) if you are from the same field. If you need any kind of support, the centre is happy to help, able to share a useful spectrum of contacts! This centre offers team offices in a classical Berlin style building in Prenzlauer Berg, just five-minutes from Alexanderplatz. This space makes up a co-working space with flexible and fixed working desks, a café, a spacious event space as well as flexible childcare service on-site. The event area includes three rooms of varying size for meetups, workshops, company events and is outfitted with professional equipment. You can also benefit from this centre’s range of assistance that will enable your operations to be carried out as efficiently as possible, such as an onsite management team, postal facilities/mail handling, multilingual staff and IT support. At the end of 2017, this new work area will be opened in the heart of the city, in the most popular street in Berlin – Friedrichstraße! The famous department store Galeries Lafayette directly opposite, the Gendarmenmarkt and the Boulevard Unter den Linden in the immediate vicinity. The appealing building architecture and the completely renovated office and conference rooms offer a pleasant working environment to the pulse of the times. Your business can surely benefit from this centre’s excellent facilities and services, such as administrative/IT support, reception services with telephone answering, and excellent breakout/lounge spaces. 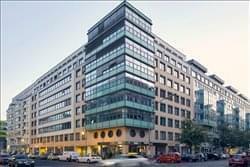 These offices boast spectacular views over the Boulevard Unter den Linden as well as over the atrium. Clients may use the meeting rooms, which can accommodate up to 30 people. A multi-media store is located in the basement of the center for your convenience. With the excellent facilities offered at this space, your business can benefit greatly from cutting-edge technologies and services. For example, the space gives access 24/7 so you can work as late as you want. In addition, complementary beverages are provided so you can recharge throughout the day and stay motivated. 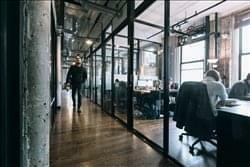 There is also a security system integrated into the building’s infrastructure so you can work with peace of mind in one of the beautifully designed offices. This centre features a variety of amenities such as high-speed Internet access, an elegant lounge area, 24-hour monitoring, secure underground parking and breakout areas. Clients can enjoy the use of four fully furnished and equipped meeting rooms and several touchdown areas in the business lounge for mobile businessmen. This prestigious and modern business center that meets the highest expectations. This center offers you office spaces for from one to 20 workstations. Offices of every size are available, including single offices, team offices and office suites. Virtual offices are also available. This outstanding centre is fantastically located right on Potsdamer Platz, and offers a prestigious address in one of Berlin’s most vibrant neighborhoods. Access to the gorgeous central plaza and sweeping views of the city make this a popular spot for creators in all industries. With a unique interior design, lounges and high speed internet, this centre encourages creativity and collaboration. Community managers are always on hand to help, so you can focus on work and enjoying all the micro-roasted coffee and purified water you can drink. This centre hosts plenty of social, education and workshop events where you can meet your industry peers, network with clients, or learn more about special topics of interest. The impressive pre-WWII building is located directly on the Kurfürstendamm boulevard which is one of Berlin’s most prestigious addresses. The building has been completely refurbished inside. 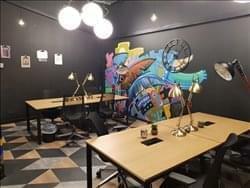 On offer are offices for two-eight people, coworking spaces and conference rooms so that tenants are provided with flexible workspace that is just as versatile as their operations. This centre is suitable for businesses of any background. Virtual office options also include business address, telephone answering, call-forwarding, VPAs, mail forwarding and multilingual language call management for your convenience. Once an old industrial building, this space has been converted into a charming high ceiling office space full of natural light. 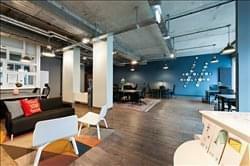 This impressive space in the heart of Berlin boasts a private courtyard, lovely breakout areas and terraces, 24/7 access, free meeting rooms and free boutique coffee. The building has multilingual community managers on hand to support your business, as well as secure storage and fast internet. This well equipped centre will enable businesses of any background to flourish under impressive, motivating conditions. You can also benefit from the site’s IT support that will ensure your systems remain connected throughout your occupancy. Offering more than 880 square metres of space, this brand new location in the city centre of Berlin will open its doors in December. This newly renovated location offers meeting rooms, a barista café, kitchenette, and can accommodate large teams. Offices vary in size, from 3 individuals to 15 individuals. There are also communal areas to benefit from including lounge areas and access to telephone booths. A community barista offers much more than simply an amazing cup of coffee – they are also available to welcome your guests, help set up printers and takes care of any queries you might have throughout your working day. Rooms are fully equipped and ready to use with ergonomic office chairs, desks/standing tables at request, lighting and power supply. All rooms have CAT7-Lan and high speed internet throughout. This wonderful centre offers a great atmosphere for clients looking for both private offices and coworking spaces. The creative atmosphere and open spaces within the offices allow clients to network, collaborate and grow their business. Your business can benefit from the space’s high speed internet, printing and conference rooms, and the on-site community managers are there for support if you need it to help your business run efficiently. The flexible terms and 24-hour access that this building can offer also means that this enables you to use all the facilities where necessary, at the hours you see fit. This centre is situated at the western end of Unter den Linden, this center is on the first floor of one of the many stylish and modern buildings put up to return the cobblestone Pariser Platz to its former glory as a focal point of the whole city. The building occupies a dominant street corner position with cream external frontage, floor-to-ceiling windows letting in natural light and ground-floor shops. 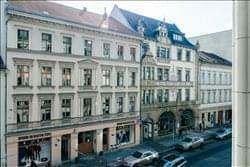 It is adjacent to the Kennedys Museum and the Akademie der Künste (Academy of the Arts). This business centre with outstanding modern architecture is found within Berlin, the federal capital. Potsdamer Platz is the buzzing centre of an exciting metropolitan city, found within a lively district. This centre provides an ideal location whether you are a new start-up business or an existing enterprise. The centre offers a range of work spaces, including office suites, coworking areas with hot desking and virtual office options where you can benefit from a prestigious business address. Working spaces come beautifully furnished with an abundance of natural light. You can scale up as required by the growth of your business, ensuring you never pay for more space than you need. Administrative support is provided whenever needed, by a professional and friendly on-site management team – this include reception services, telephone answering and mail handling. 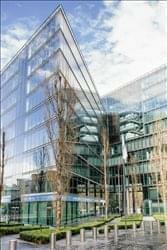 This prime business centre, located a prestigious area of Berlin, offers serviced offices exclusively furnished and technically equipped to a high standard to enable businesses of any background to flourish under impressive conditions. Offices are available to various sizes and come with an inspiring atmosphere. The building is accessible 24 hours a day; perfect for those with contacts across different time zones. Here, you will also have access to common areas and breakout spaces, as well as support from an on-site reception team who can assist with greeting your clients, telephone answering and mail handling. 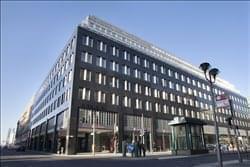 The business center is situated in a modern office building in Berlin Mitte at Hackescher Markt in the direct vicinity of the German government offices and buildings, right on the pulse of the commercial, media and cultural center of the city. We offer excellent modern and relaxing working conditions as well as high speed internet access, virtual office services and co-working areas. The business centre is well equipped with meeting rooms and the latest technology. This is the perfect workspace solution for companies of any background that value practicality and accessibility in addition to a range of quality facilities. The centre provides the ultimate set-up for any business, offering on-trend workspaces in a collaborative and innovative community. This space comes equipped with a fully stocked kitchen, access to networking events and workshops, flexible membership plans, plus a handful of inspiration is available at all times! With access available to the centre’s coffee bar and soda fountain, growing your business empire won’t be a problem in this wonderful space. This business centre offers a community of professional who believe in collaboration, personal development and achieving your full potential. This is the ideal space for the creative industry and those in the start-up ecosphere. The space offers a space of working solutions including coworking options ideal for freelancers and entrepreneurs. You can also choose from a selection of private offices where you can benefit from great in-house services and amenities. Your membership includes access to high sped internet, 24/7 access allowing you to work at your own pace whenever you want and the use of conference rooms. 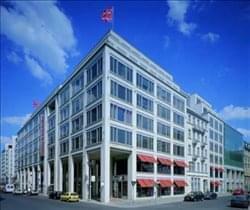 The address is prestigious and well-known, placing you and your business at a great advantage. At this centre they offer 1.430 qm with 38 exclusive full furnished office rooms to welcome your guests perfectly. 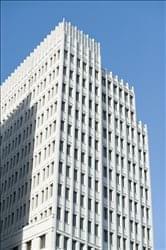 This superlative business center provides history-charged ambiance mixed with livelier business club atmosphere. The open areas usable as meeting points for social networking talks as well as several conference rooms providing an exclusive all round service. One of the highlights is the new design glass cube with acoustic protection and latest conference technique created by the company “Strähle”. The attractive conference rooms with chandelier and classic design creating always the right setting for your meetings. Furthermore there is a vintage chimney lounge, a bistro bar in loft style, sundry sofa and chair groups as well as a diner’s area. This is one of the less historical buildings which were not completely destroyed at Berlin’s most popular boulevard “Unter den Linden” during the Second World War. In 2005 the building was renovated and formed to new business rooms by the architect Axtelm Frinken. He created the heritage building after original plans, pictures and documents dating back to 1775. Historical parts which were completely destroyed by bombs got interchanged with attractive glass walls. In the past it was one of the prestigious hotels of Berlin named as “Grand Hotel de Rome” and got well known after the legendary strong room burglary of the “Pannewitz Gang” in 1951. This Story was also filmed in the first German-German film production with the titel “Der Bruch” with Götz George, Rolf Hoppe and Otto Sander. To obtain information for your selected Berlin Mitte Serviced Offices, please tick the "Add to basket" box for each office you prefer and complete the form below. We will then send a detailed report via email.